To start off with we had been told about the border control and how it would probably take at least 2 hours to get through with them checking through everything including photographs, laptops, and unpacking every item in our bags. The security staff were pretty friendly and as we were prepared to unpack everything we were pleased that in the end it probably took 1 hour. They didn’t look at any of my electrical items and just asked about the medication I had with me. Andy took a little longer but it seemed more as the guy was enjoying chatting and wanted to look at his photos. Once through we were relieved it had been much easier than we’d expected and were soon greeted by numerous locals welcoming us and shouting hellos. People seemed very friendly and keen to chat. 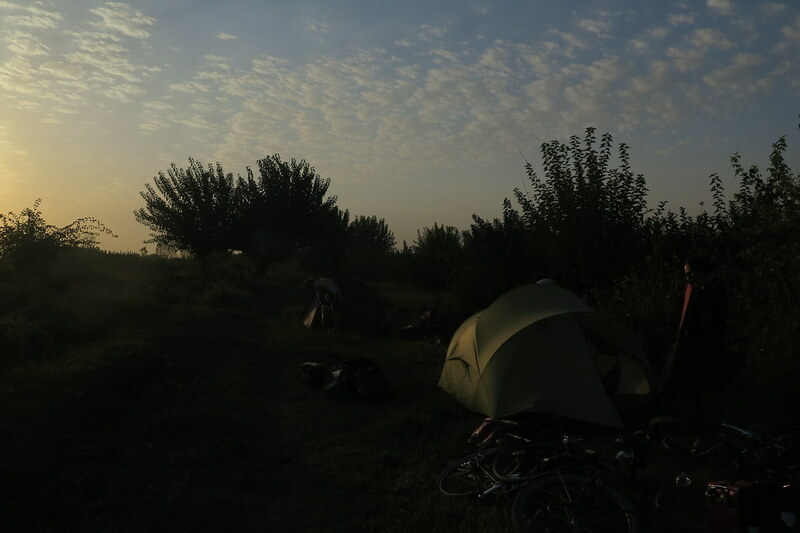 We had planned to cycle to Samarkand but I had been feeling awful from the medication I was taking. It meant we ended up taking a taxi and leading to us only cycling for 4 days in total in Uzbekistan. We’d always planned to only cycle the first part with timings of visas and not wanting to cycle through the desert but it was a bit of a shame we missed out on the first, more interesting part. It did mean that we could catch up with Tim and Claire and join them, before we had to say our final farewell and go in different directions. The parts we did cycle were still flat, fast but quite boring so we didn’t miss much by taking taxis and a train. It highlighted that we did enjoy the slightly harder but more interesting terrain to cycle on. The landscape mostly was desert, some agriculture, and loads of cotton fields. 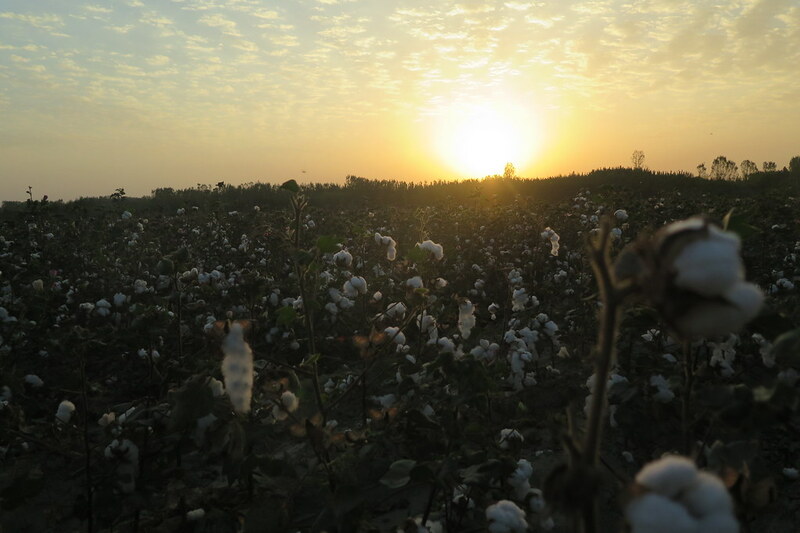 The cotton grown has caused a great impact on the natural environment. Brought in during the Soviet time and not native to the country it requires an enormous amount of water. A lot of this has come from two major rivers that were diverted from their natural course to irrigate the crops. 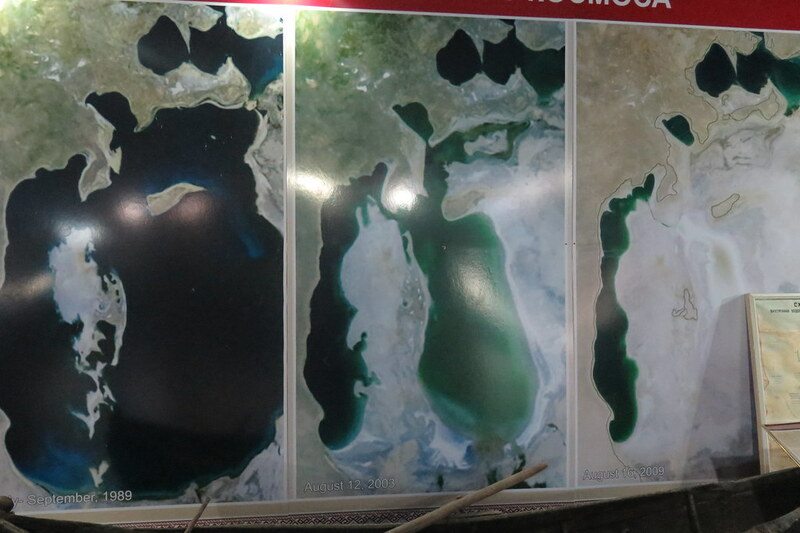 It led to the Aral Sea retreating and evaporating to less than 1/3 of it’s original size. The increase of salt levels killed off the fish and marine life, and this meant the destruction of the fishing industry in this area and left many people out of work. The large canning factory was closed in the late 1990s. It’s a sad story and it was an eerie experience going to where the sea had once been seeing all the rusting boats left behind. It seemed to be cotton picking season whilst we were there and there were masses of people out in the fields picking it. 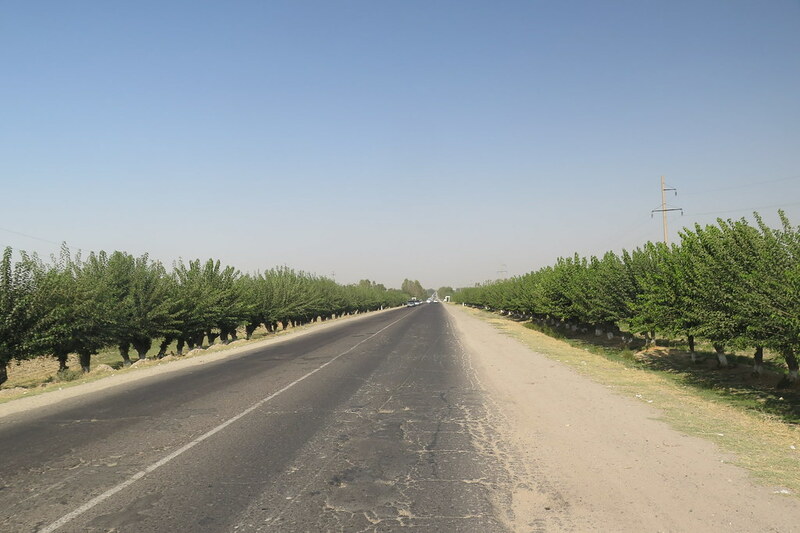 It’s state controlled and Uzbek’s largest cash crop. Over a million of the public, including kids, have to go and pick the cotton for little or no money. With the need for more food crops the industry is slowly decreasing but for now it is still a big part of the economy. 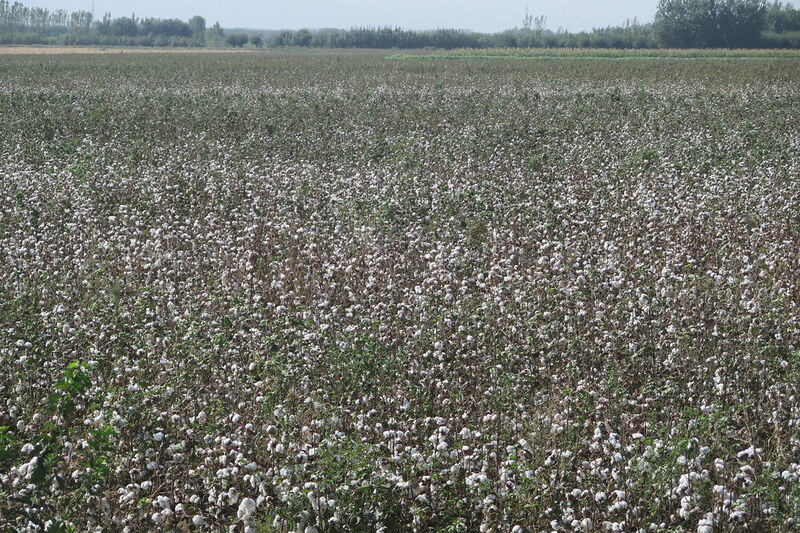 Many people are trying to boycott Uzbek cotton because of the working conditions. Something I knew little about before visiting Uzbekistan. 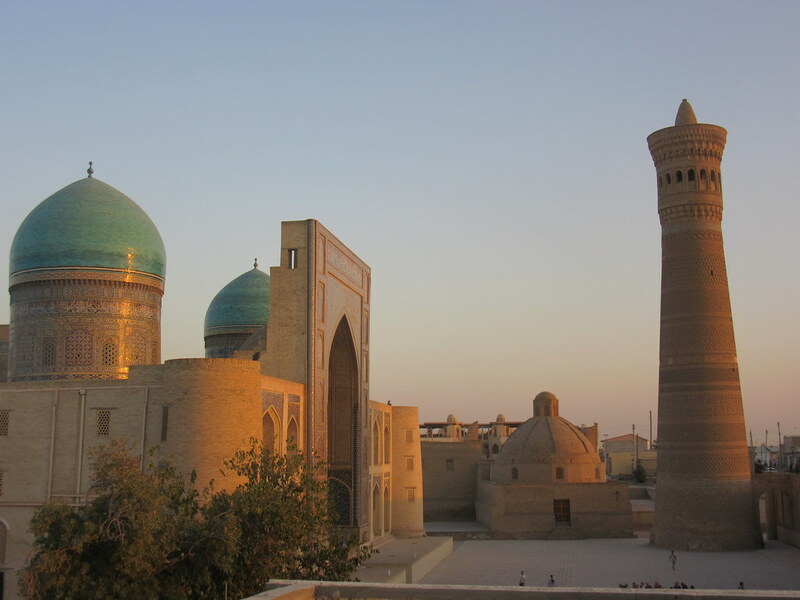 Moving on to the Silk Road cities, Samarkand, Bukhara and Khiva. We really enjoyed doing the tourist thing and looking around these beautiful buildings. Yes they had all been renovated and the areas were all a little artificial but I was fine with that. After Tajikistan it was completely different to what we’d been up to recently, and a nice change of pace. 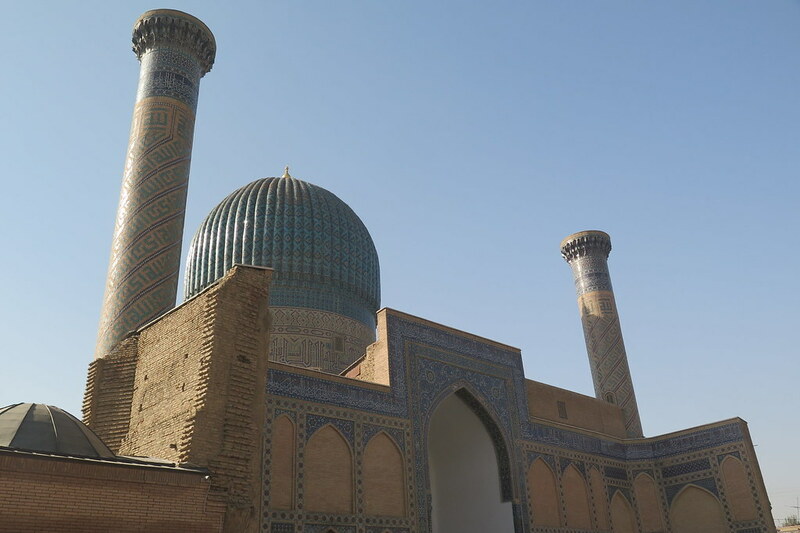 In Samarkand and Khiva we had a tour guide to lead us round and explain the history behind the different madrassas and mosques, most of which I couldn’t tell you about now but better than our aimless wandering we usually do. It was also great to spend some more time with Claire and Tim. 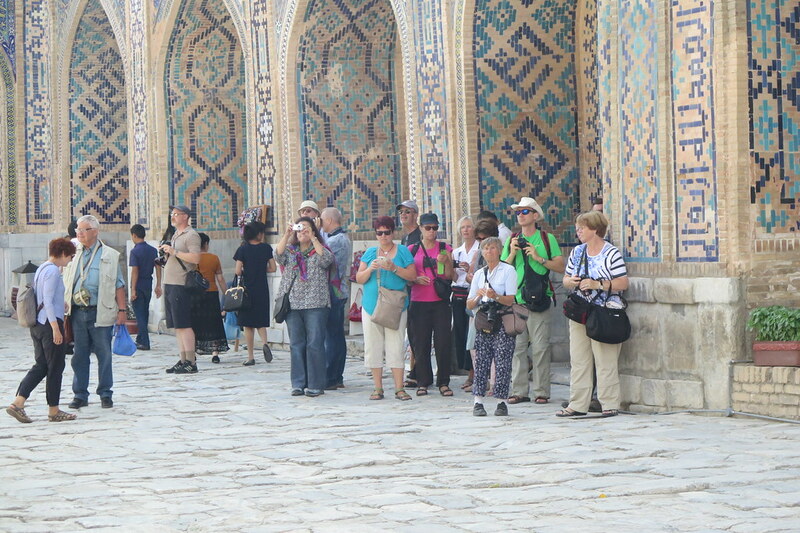 There were not too many younger tourist, a lot of Europeans who were on coach tours and retired. This meant that the prices were pretty high in all the cities. Go outside the gates or a little further and it was back to local prices and better portion sizes. Sometimes it was a little frustrating trying to haggle down the prices, the worst was in Khiva by far which spoilt the experience a little. We took a taxi to Kungrad, where we’d be taking our train to Kazakhstan from. 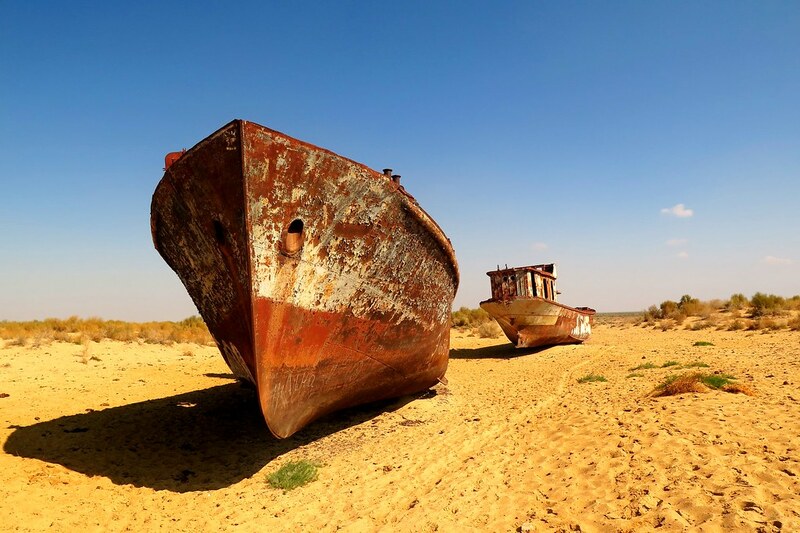 We needed to stay two nights as we had wanted to take a trip to Moynaq to see where the Aral Sea had been. On arrival we were taken over to a ‘hotel’ (which is meant to be the only one in town) that wanted to charge us $10 each per night for a room with a squat toilet outside and no shower and no breakfast! We fought our case and managed to get it down to $10 for both of us per night. Then there was the taxi that she insisted on getting for us and wanted to charge 3 times the price we ended up with. I don’t mind friendly bartering but this was quite underhand. After such a great impression of the people we met when we were first came into Uzbekistan it was sad to leave with this as the last memory. Not being a rich country there was a massive difference between the tourist areas and the other towns/cities but it felt like in the tourist areas, especially Khiva (for me) people were out to make as much as they could from the tourists but in a kind of ruthless way. I’m sure many tourists accepted the prices or they were included in their tour but overall I’m not sure the income from tourists is trickling down to other areas. Are the rich becoming richer and the gap between the poorer and richer increasing? I’m not sure and I hate to sound so negative about people but it’s what I felt. 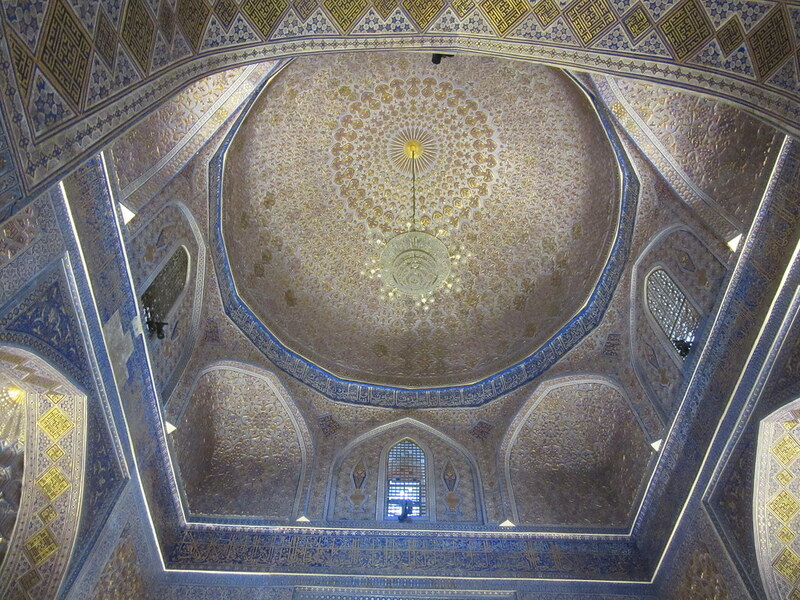 Especially as my overall impression of Uzbekistan was far better than what I had expected. With the recent death of the President who has been in charge since Uzbekistan became an independant country maybe the future is uncertain how the country may change with a different leader. There will be an election held in the next couple of months so it will be interesting to see if much changes afterwards. From an outsiders point of view, Islam Karimov was critised for many atrotious acts of human rights abuses and corruption, but speaking to people after his death they were genuinely sad to loose a great leader in their eyes. He was mourned by thousands of people who visited his body in Samarkand, where he was from. We had heard or read about other tourists being asked to pay money to officials when crossing borders or maybe to put our bikes on the train, but we saw none of that. Most officials were very friendly and some quite talkative. Overall we really did enjoy visiting the Silk Road cities. 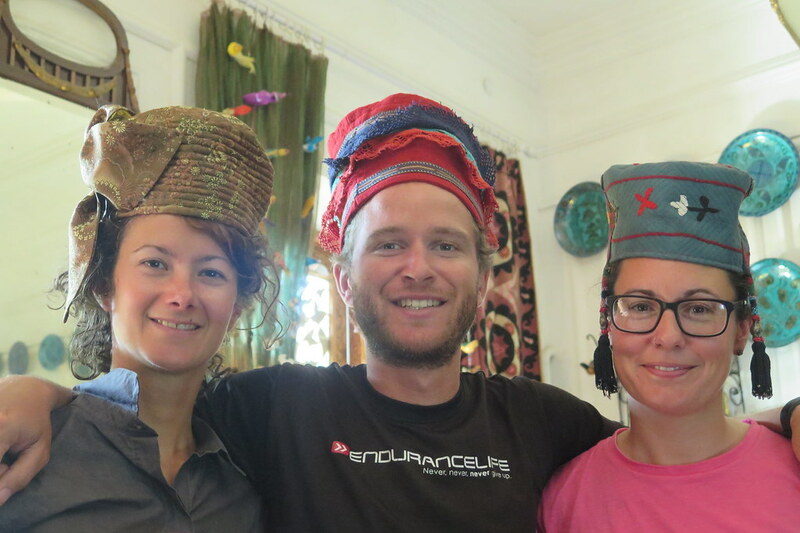 It was also fun to cycle from Samarkant to Bukhara with Claire and Tim. The roads were pretty good and camping was a bit harder but we found good spots. We even managed to break our cycling distance record in one day 117km followed by 115km the day after! The weather changed from being too hot and not being out in the afternon heat, to having to layer up and dig out a waterproof jacket. We are definitely moving into cooler weather. And the food, well we really are looking forward to moving on to something different, then again a good shashlik and a cold beer still tastes amazing even after four months of it. So next we will be moving out of Central Asia and to the Caucasus. Another new area for us both. What an adventure! Uzbekistan is not one of those countries blessed with oil and gas apparently as we gather from the post. We had the impression the “stans” of central asia were all resource rich. Guess a myth had been exposed! Kazakhstan and Turkmenistan seem to have all the oil! Not all the ‘stans are oil rich, as you say. Tajikistan especially is very poor. Keep cycling! And keep the updates going! Hope the next leg of journey will be good, and no more illness that must have been awful. Thank you for reading. Of course it’s only a snapshot of Uzbekistan. Being an outsider we can never gain a full grasp of life in a country but we truly enjoyed our time there. We covered most of things we wanted to see but it would be interesting to go back in the future (as in 10 years) and see how the country develops.